If you’re not Polish, a word like makowiec (Ma-KOH-viets) won’t mean very much. But if you are Polish, and grew up in a Polish or Eastern European household like myself, the word makowiec arouses a hunger for which there is no other substitution. A dessert table in my childhood would not have been complete without this roll taking center stage. This coffee cake has a very distinctive taste that I absolutely love and crave. The poppyseed filling is a paste that is available in the baking or ethnic aisle of your grocery store. Poppyseed roll was always around during holiday times. A friend of my parents, Frank Majcher, a baker who worked for one of the large bakeries in downtown Los Angeles, made about the best poppyseed roll I have ever tasted. When Frank passed away many, many years ago, I thought I would never taste another poppyseed roll that even compared to ones Frank used to turn out. After reading many recipes and putting my own spin on them, I have created what I think is the best poppyseed roll out there. The taste takes me right back to my childhood and I never wait until the holidays to make this very special dish. We can never get enough of this at our home. It’s addicting. In a small bowl, dissolve yeast in 1/2 cup of the warm milk. In the bowl of a stand mixer, combine flour, sugar, salt and eggs. Add remaining 1-1/2 cups warm milk, butter and yeast mixture. With the paddle attachment, beat until smooth. The dough will be very dense and sticky. 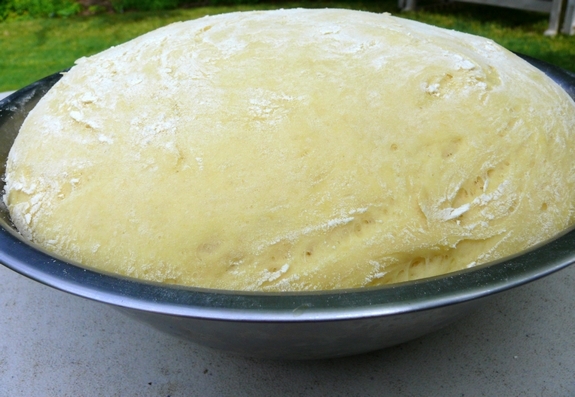 Scrape dough into a clean, greased bowl. Sprinkle the top with a little flour and cover. Let stand in a warm place for2 hours or until double in size. Punch down and turn out onto a floured surface. Divide dough in thirds and shape each into a rectangle using a rolling pin into about a 1/8″ thickness. The rectangle will be fairly large. Rub a teaspoon of vegetable oil (or more) onto the surface of the dough, making sure to get to all the edges. Sprinkle the dough with sugar. Spread one can of poppyseed filling onto each dough rectangle. This can be tedious to spread, taking maybe 10-15 minutes for each roll. Sprinkle filling with 1 cup chopped walnuts. Roll the dough up like a jelly roll, turning ends under so filling will not leak out. Place the jelly-rolls on parchment, silicone or a greased pan, cover and let rise again until double in size. Two rolls will fit on one pan. Heat oven to 350o F. Brush tops of rolls with additional melted butter. Bake 40-60 minutes or until golden brown. Remove from oven and cool completely. You can dust with confectioner’s sugar or make a glaze (confectioner’s sugar and milk)to drizzle over them, if desired. The rolls also freeze really well and taste fantastic!! Rub a teaspoon of vegetable oil (or more) onto the surface of the dough, making sure to get to all the edges. Sprinkle the dough with sugar. Spread one can of poppyseed filling onto each dough rectangle. This can be tedious to spread, taking maybe 10-15 minutes for each roll. Sprinkle filling with 1 cup walnuts. Roll the dough up like a jelly roll, turning ends under so filling will not leak out. Ooohh I love these! I l made one last year and it was soo good, this looks amazing! J really love this sweet bread, thanks for the recipe Cathy. I should try to make it for him. forgot to ask you a question. Where can I find that poppy seed filling? Where the pie fillings are. That’s were I found mine. Ohh Yummy! Thanks for sharing the recipe! Check the baking aisle first of the grocery store, usually a brand called Solo is available. Once in a while it’s in the ethnic aisle.Â Most grocery stores carry it, sometimes it’s on the top or bottom shelf since it’s not a real popular item.Â Worse comes to worse, you can order it online from Amazon. I’ve never seen anything like that before but it looks amazing! Mmmm, this looks delicious! I live in the Czech Republic, and poppy seed pastries are very popular in the local bakeries, and oh, so yummy! I’m definitely going to look in the store to see if poppy seed paste is carried here. This is my first time on your blog. It looks so good, and it is taking me back to my childhood, too (I grew up in East Europe). My mom used to bake this roll on Christmas and Easter. Do you have a recipe for the filling? I would like a home made one. 1-1/2 pounds ground poppyseeds (use a grinder), 1-1/2 cups sugar, 1 cup softened butter, 1-1/2 cups hot milk, zest of one lemon. Grind the poppyseeds, then combine all ingredients.Â Beat well and divide among the three loafs. I have not had one of these since I was a kid, when my Babci made them. Thank you for the recipe, it looks delicious! oh, my, what a pleasant surprise! I grew up in Polish/Slovakian household, so I recognize Makowiec and also know it as kolache (Slovakian). Look forward to making this. Thanks! This is an exquisite piece of pastry…wow. 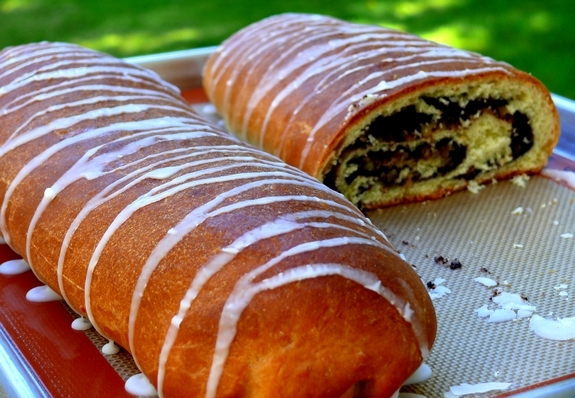 I love poppyseed filling and this is a must make!!! My Czech/Hungarian grandma lived with my family when I was young and my mom and she would make a similar poppyseed pastry and other lightly sweet cookies at Christmas time. One of my favorites was a cookie that was made by sandwiching a walnut filling between 2 layers of pastry dough and cutting them into strips that you’d twist and bake flat, then sprinkle powdered sugar all over them once baked. So good! My mom always used to tell me how similar Polish cooking was to her Czech/Hungarian style, and by the look of your recipe, she’s right. Thanks for posting this recipe…it’s neat to see other people in the world make this unique recipe. I am not Polish, but Macedonian, and my grandmother used to make this all the time when I was a kid. I still make it today, and your recipe is identical to mine, except for the walnuts. In fact, we use the same dough recipe for Walnut Roll – filling is walnuts and sugar. Anyway, it was cool to see that familiar swirled bread on your post; I just love Poppyseed Roll! I remember these growing up. Thanks for reminding me, it’s been far to long since I’ve had one. I was shocked to see your pics on Lummi Island. I grew up not far from there so to see someone actually mention a vacation in the area that I grew up is always a nice surprise. Glad you enjoyed your trip and saw the beauty of the area. yummy! my family is from Romania and we make this a lot too, though we call it cozonac cu mac. When we were kids our mother would buy whole poppy seeds and we would grind them in this contraption that we brought over from Romania; it’s very tedious but it helped some my mom some money. I love her poppyseed rolls but yours looks like it comes out a lot more moist than hers, and we never thought to put walnuts in the poppy seed filling. We have a different type of cozonac in which we use just crushed walnuts mixed with sugar, but never thought to mix the two together. i most definitely need to try your recipe and compare! I am eager to try your recipe – the sweet bread looks delectable! It would be wonderful if you would feature other traditional desserts of Polish and/or Eastern European heritage for those of us that don’t have access to heritage family recipes. Smaczne! I am Polish and love this pastry. It does bring back so many memories. Though I am fortunate to have Polish delis nearby to make a quick jaunt to pick some up but having another recipe … YUMMY! 🙂 More family recipes please! I always add to my own! I am SO excited to try this! My grandmother made this and a nut roll and I’ve never been able to duplicate it. I am making it this weekend! I’ve had a few cans of the poppy seed filling waiting for a cause. Yay! Can the loaves be frozen, do you know? I read somewhere that it’s a good idea to heat up the poppy seed filling in the microwave for some seconds. It makes it easier to spread. I had hoped my local bakery might start baking these, but though they had a suggestion box, and I put in the suggestion – they never did. So, after ordering from a couple of places online, I decided to try my hand at making them myself – and am glad I did. Among other things – no shipping fees!! I guess you could but I’ve never had a problem spreading it. Enjoy. I made this today and the dough was fantastic. I did use a poppy seed filling that I bought. It came from Poland and had my cousin send it to me from a Polish store in New Jersey. What a difference from the filling that is made here. Totally different. I’m not a fan of the poppy seed filling that I’ve tasted, i.e., Solo, etc. it’s way too sweet for me. This filling had a nutty flavor to it and wasn’t cloyingly sweet. Going to use the dough to make a walnut strudel. Thanks for the recipe. Thanks so much for this recipe! My 3 loaves are rising right now. They look so good! One thing I did to make the poppy seed easier to spread was to wait and sprinkle the sugar on after I’d spread the poppy seed. Somehow spreading it onto the oiled dough was easier than over the sugared dough. Can’t wait to taste this. I am in love with your blog! I posted some Polish recipes for Easter and used your photo which links directly back to your site. I am looking forward to finding a bottle of your wine. I love the wines out of Oregon. I lived there for awhile and fell in love with the area. I am back home in NH now, but miss OR all the time. Thanks for all your amazing recipes. I plan on losing track of a lot of time on your site. Happy Easter! Just made some in a 13×9 pan…. the loaf didn’t maintain its shape very well. I had issues spreading the canned paste with a spatula and it pulled the dough too thin (the loaf is oozing along the sides). Discovered a little late that an offset spatula is perfect for the he spreading!! Yes, you really have to have patience during the spreading! This brings back such memories. My great grandmother immigrated from eastern Europe in 1902 and I remember her making this bread, the smell and taste. I plan to make it for Christmas as a surprise for my mom. My grandmother used to make this all the time. I am now 75 so she has been gone for many years but I can still remember this being one of my favorites. She was of Austrian/Hungarian descent and made some of my favorite foods. 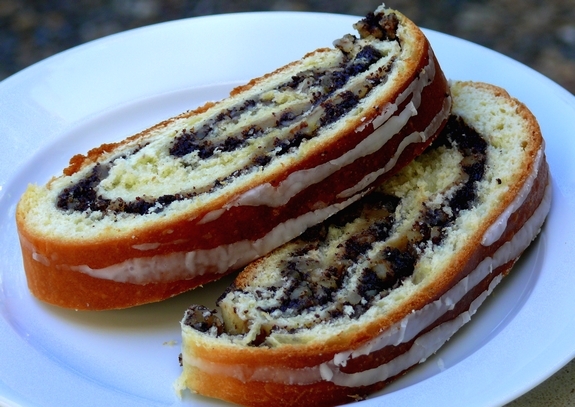 We always just called it poppyseed roll. So glad I have found this recipe. I don’t remember her using any nuts. Also thank you for the true filling recipe. I don’t do much baking anymore but will be sure to make this. I can taste it already. Cathy, I’m polish too and enjoy making these dishes . My mother and grandma used to do a lot of baking. That is how I got started, but my grandmother made a lemon favor cheesecake that my sisters and I could never seem to get right (no recipe ever wrote down) so we keep trying. Thanks for your recipes. They bring back a load of memories. They look delicious but don’t plan on eating many if your job gets random drug tested. You may get popped for opiate usage. I love makowiec. The best one I’ve ever tasted was from this Polish bakery in Connecticut (Unicorn Bakery, if I recall correctly). Amazing. The Poles in CT say the same. They also make strudels with nut fillings and babka with strawberry and cheese, blueberry. I have a very silly question. The recipe makes 3 loaves, but it says 2 will fit on the cookie sheet while they rise. After rising, do you tightly put them all on one cookie sheet to fit, or do you bake the third one after the first two are done? Thank you. p.s. I love so many of your recipies, thank you for sharing them! The 3rd loaf goes on a separate cookie sheet and baked alone. Once rolled up,how long does it take rolls to double in size? Thanks so much for this recipe! I’ve been searching for one that looks like my grandmothers, and yours is the first one that does. I was already working on translating one from Polish. Can’t wait to make this! I did it! They taste great, but aren’t really so pretty on the outside. The poppyseed filling bled through the dough in some areas, and it was very hard to move them from the baking sheet to a rack without cracking. Perhaps I rolled it too thin? My rectangle was about 12″ by 5.” Advice? And thanks loads. Your recipes are always delicious! My grandmother made poppyseed and nut rolls all the time. I remember helping her when I was a little girl. I’m looking forward to trying your recipe to share with other family members. Do you know if the loaves can be frozen? Thank you. 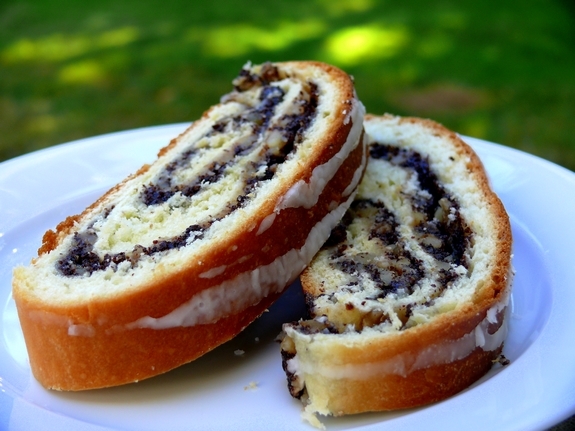 My Hungarian grandmother made this alot when I was a child, she made all poppyseed or all walnut roll, so tasty, my siblings love this as do I. Its a must try, can you freeze them as more than one roll would be too much with just the hubby and I? Yes, it freezes well. Slice it before freezing and then you can take out slices to enjoy. My rolls turned out monster large…what happened?!?! Did you let them rise too long? I’ve been looking for a recipie like this for years. My grandmother used to make both poppy seed and walnut rolls. Only difference is she always added raisins to both which always made the rolls nicely moist. I also find the canned poppyseed sweet but a squeeze of lemon juice seems to help. Great dough recipie! Correct about slicing first and freezing….I grab a slice or 2 for breakfast and pop them in a toaster on low heat…fantastic!!! My mom made poppy seed coffee cake in bread pans with homemade poppy seed filling made with honey. Does any one have a homemade poppy seed filling with honey. The recipe my mom had and I found just recently is very vague but those breads were delicious. Mom has passed many years ago. please and thank you. I make my own poppyseed filling, but you have to have a poppyseed grinder. Thanks for the recipe…I will definitely make this! My German Grandmother passed this recipe down to my mother and then to me. So happy I found a really good recipe that uses already made poppyseed filling. The old way takes way to long. We have in the past few years used frozen bread dough in the stores but this recipe with sweet bread is a “Must Try”! Thank you so much Cathy for this easy recipe!